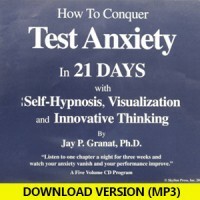 Jay P. Granat, Ph.D. is a Psychotherapist, author the the Founder of ConquerTestAnxiety.com and StayInTheZone.com. He has been featured in major media outlets including Good Morning America, The New York Times, The Wall Street Journal, The BBC and CBC. Dr. Granat writes a weekly column for five new papers. He has written and lectured extensively on peak performance and he uses these techniques to help test takers to perform their best.